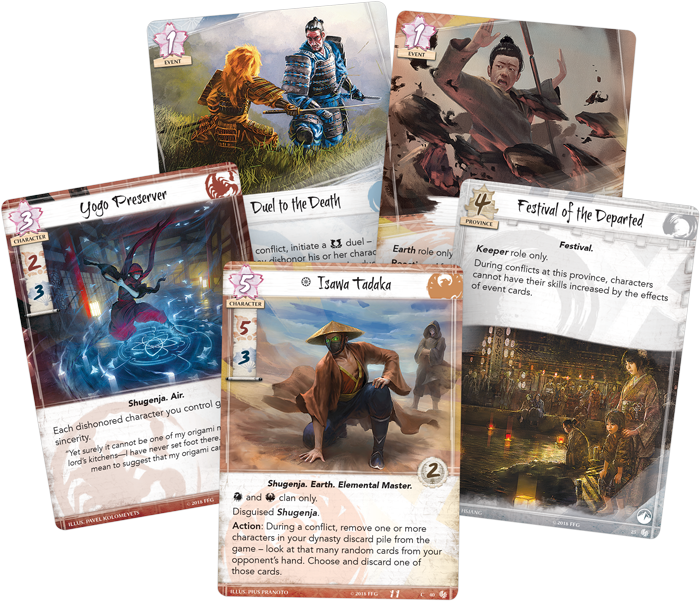 Legend of the Five Rings is growing with the next cycle of cards as the second Dynasty Pack has been announced by Fantasy Flight Games. 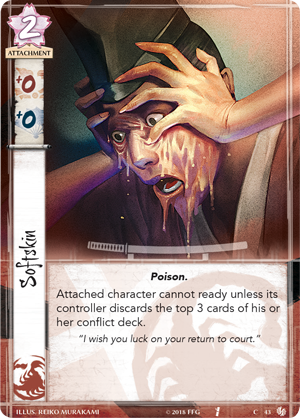 Bonds of Blood brings in a new keyword and a host of new cards for each of the Clans of Rokugan. 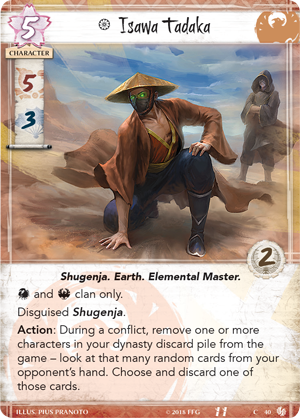 While we don’t know the full impacts of the Disguised mechanic yet, Isawa Tadaka is going undercover in this Dynasty Pack. For starters, he can be played by both the Phoenix and Crab Clans. In game, you can use his Action to remove cards from your dynasty discard pile, then you can view that same number cards from your opponent’s hand. Then you can choose one of those cards to discard it. 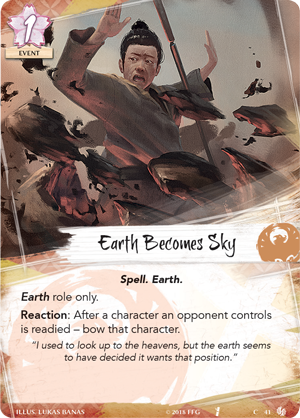 Earth Becomes Sky is another card that will benefit the Phoenix Clan. This card allows you to bow a readied character! That can be extremely powerful for locking down scary targets from your opponent’s line-up. They may have ways to ready those characters, but if you can force them to spend the resources now, that will stop them from doing that later. 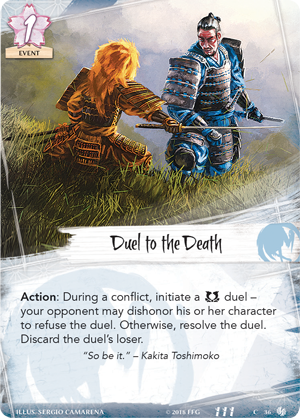 And speaking of duels, we also have Duel to the Death as a new Event card for the Crane Clan. This initiates a military duel during a conflict and it’s a similar set of choices as the Arbiter above. However, the penalty for losing this duel is that the loser is Discarded. Now THAT is a tough decision! First off, gross. That guy’s skin is melting or leaking or …I dunno. It doesn’t look good and he should probably see a doctor. 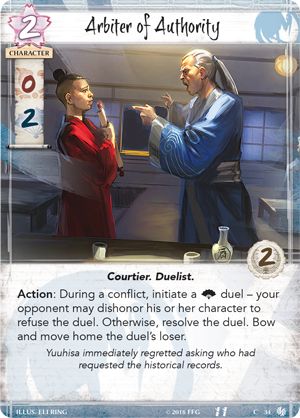 Anyhow, this card is potent because it forces your opponent into another set of tough choices: Do I leave the character bowed or do I discard 3 cards from my conflict deck and hope that I didn’t need those anyways? That a tough one! Depending on the target of the poison, this card can be really effective! If you manage to tag a character with a lot of fate and they are going to stick around for awhile the effects are just going to pile-up. 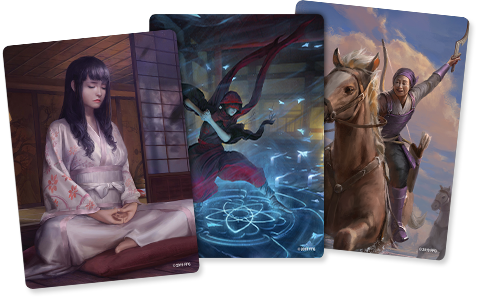 As an added bonus, if you pre-order Bonds of Blood from the Fantasy Flight Games website, you also gain access to three exclusive art cards featured in the pack! 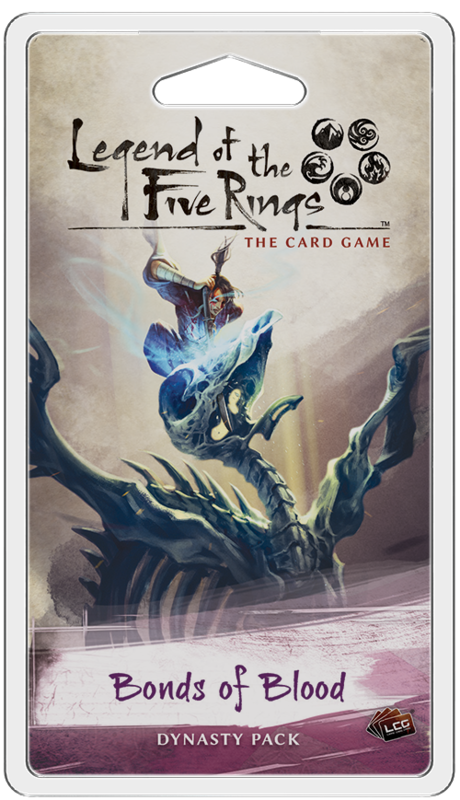 These cards feature no text, allowing you to enjoy the full art from Leo Avero, Pavel Kolomeyets, and Pius Pranoto! Not a bad deal from FFG if you ask me! Be sure to keep an eye out for this pack and the previous pack in the Inheritance Cycle – hitting stores later this year. Face the challenge or face dishonor!